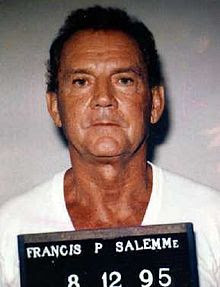 Former New England Mafia boss, Francis "Cadillac Frank" Salemme has been found guilty in the killing of nightclub owner and federal witness Steven DiSarro in 1993. The jury also found Salemme associate Paul Weadick, 63, guilty of murder. Both men are scheduled to be sentenced on Sept. 13 and face a mandatory life prison term. The star witness for federal prosecutors was Stephen "The Rifleman" Flemmi, who worked with Boston gangster James "Whitey" Bulger. 1993 FBI surveillance photo. 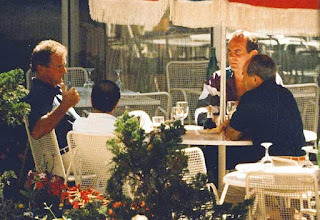 Francis "Cadillac Frank" Salemme, left, Stephen "The Rifleman" Flemmi, second from left with back to camera, and Frank Salemme Jr., behind right.